Sam Allardyce’s departure as England manager was a “joke”, football agent Scott McGarvey has said. McGarvey also said he felt guilty for introducing Allardyce to undercover reporters posing as investors, which ultimately cost him his job. “I’m devastated. He’s got to feel I’m responsible,” said McGarvey. Allardyce left his post by mutual agreement following claims he offered advice on how to “get around” rules on player transfers. The 61-year-old former Sunderland manager was also alleged to have used his role to negotiate a deal worth £400,000 to represented a Far East firm. 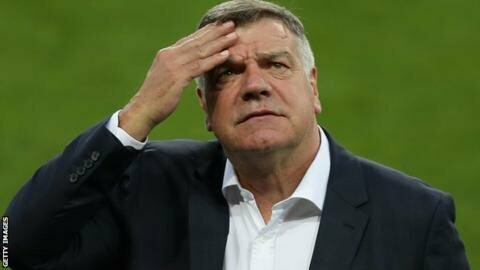 During the meeting, which was recorded on camera, it is alleged Allardyce said it was “not a problem” to bypass rules on third-party player ownership and claimed he knew of agents who were “doing it all the time”. A Football Association statement said his conduct “was inappropriate”, while Allardyce said of the Daily Telegraph operation that “entrapment has won”. His England reign ended after one match and 67 days – making him the national side’s shortest-serving full-time manager. “It doesn’t matter if you’re the manager of Crewe and you lose your job but if you’re the manager of England and you lose your job after one game, it’s a joke,” McGarvey told Sky Sports.